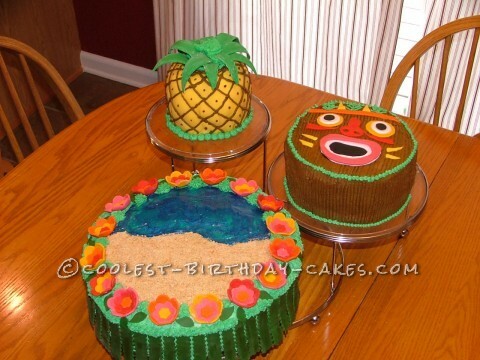 I made 3 Hawaiian Luau Cakes. The top level is a pineapple. I used a 6″ and a prep bowl to make my cake, with a little carving to tweak it. It is covered in fondant. The leaves are fondant with gum text added to help them harden and keep their shape. I piped my lines with butter cream. The Tiki center cake is 2 8″ rounds. I cut the face pieces from colored fondant. The cake is iced with chocolate butter cream and I used a fork around the edges to make it look like wood. The bottom cake is 2 10″ cakes iced with green butter cream. I used green fondant that I cut into strips to cover the outside like a hula skirt. The top is covered with Wilton blue gel icing for the water. The sand is made of crushed graham crackers. The flowers are cut with small flower fondant cutters and I mixed gum text with the fondant to harden them to keep their shape. Both the pineapple leaves and the hula skirt flowers I cut and molded and found household items to let them dry on so they would hold the shape I wanted. This was a fun cake to make and a big hit at the Luau Birthday Party!